The European Union and Cuba will intensify negotiations aimed at normalising ties, EU foreign policy chief Federica Mogherini says. Ms Mogherini hoped the two sides could sign an agreement by the end of 2015. She was speaking after meeting President Raul Castro and Foreign Minister Bruno Rodriguez on Tuesday in the Cuban capital, Havana. Ms Mogherini is the highest-ranking EU official to visit communist Cuba for several years. Her visit is seen as another sign that the island is strengthening its ties with the West, after decades of Cold War tensions. In December, Cuba and the United States announced they would be improving their ties, which have been frozen since 1961. Russian Foreign Minister Sergei Lavrov also met Cuban leaders in Havana on Tuesday and praised the thaw in Cuba-US ties. Cuba was allied to Moscow during the Cold War. While EU-Cuban relations never reached the levels of animosity of those between Cuba and the US, the EU did have economic sanctions in place against the island until 2008. Under its 1996 Common Position, the EU had moreover restricted its ties with the Cuban government until reforms were made in areas such as democracy, a multi-party system, human rights and fundamental freedoms. In February 2014, the EU announced it would enter into negotiations with Cuba to restore full bilateral relations. However, the two sides only held three meetings in 2014, prompting Ms Mogherini to call the pace "slow". 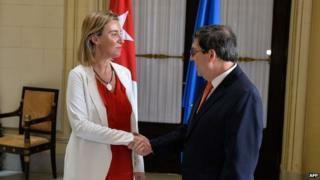 The Cuban foreign minister and Ms Mogherini are due to meet again at the Summit of the Americas in two weeks time and on 22 April in Brussels. The EU is Cuba's second-biggest trading partner after Venezuela and also represents a major source of investment. One-third of tourists to the island every year come from the EU. Top EU diplomat Mogherini to visit Cuba "at crucial time"